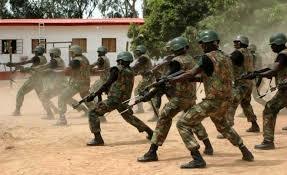 Armed Forces winning war against terrorism – DHQ – Royal Times of Nigeria. The Defence Headquarters (DHQ) has again reassured Nigerians that the military is winning the fight against terrorism and will not rest on its oars until terrorism is wiped out of the country. It, however, expressed concerned about mischievous reports by section of the media aimed at discrediting the efforts of troops in the North East. According to a statement issued by Brig.-Gen. John Agim, the Acting Director Defence Information – DDI, the report is being spearheaded by a particular foreign news agency that the Armed Forces is losing the battle against insurgency. He did not name the agency. Agim, however, said that the report was not true, ading that such malicious articles should be disregarded while the military would continue to protect the territorial integrity and sovereignty of the nation. “The report was calculated to dampen the spirit of the troops at the theatres of operation and to demean the successes recorded so far in the war against terrorism. “It is more worrisome when such an ill-informed report is coming from a supposed credible news agency expected to be a partner in progress. ” It agitates the mind whether the reporter is working in isolation or speaking the mind of its sponsors. “It is a well known fact that terrorism thrives on publicity and propaganda.